Novels, humor, and self-inflicted ordeals. 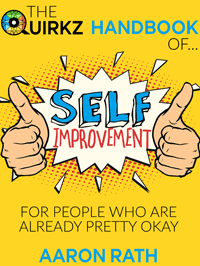 My newest book, The Quirkz Hanbook of Self Improvement for People Who Are Already Pretty Okay, is available on Amazon. And two, you’re pretty okay. You’re not perfect, but you’ve got things together, more or less. 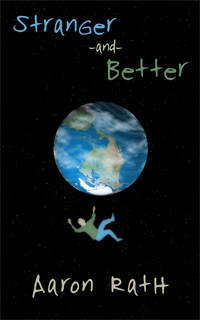 Sure, some things could be better. Maybe most things, at least part of the time. But you’re not in a bad place, really. You could even slack off a bit and still be pretty okay, or at least simply okay. But maybe life doesn’t quite have the sparkle that you’re looking for, or things have gone a little flat, and you want to shake things up, keep them interesting, maybe find another level. You don’t know what it is, but you’re certain, somewhere deep down, that there could be … well, more. My friend, this book is for you. It assumes you’re like me, and like a lot of other people I know, or have heard about, in magazines or on the internet, maybe. You have a good baseline, but you’d like to step it up. A little. If it’s fun, and not too hard. You know, more like a small nudge in the right direction (or directions) so that you can look back after some arbitrary number of days (Thirty. It’s always thirty.) and say to yourself, “I did all that? Look how far I’ve come. I spent less than half an hour a day, and took a couple of days off for bowling league or date nights or family emergencies or whatever, and I’ve still had some awesome adventures and now I have this nifty story to tell.” (Have I mentioned the Day-Off Coupons? This is the only 30-day program in the world that builds in five vacation days. That’s one of many indicators of our innovation, brilliance, and reasonability, all designed to help you succeed. Finally, there’s the fact that spending 30 consecutive days on something (almost anything, really, but especially intentional improvement) is a bona fide accomplishment. It is practically guaranteed to feel fantastic at the end. And who wouldn’t want to feel fantastic and accomplished? Let me reassure you, this is no joke. If you spend a month (more or less) pursuing every activity in the book, by the end you will indeed have several worthwhile stories to tell. You will have discovered new things about yourself, pulled off things you didn’t expect you could (probably, unless you have exceptionally high expectations or something, in which case maybe you should be reading the Quirkz Handbook for Total Badasses Who Don’t Need to Improve at All), and you will have become something different: not just so-so, not just okay, but maybe (just maybe) pretty good. 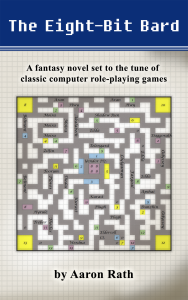 Available in print from most online retailers or in Kindle format at Amazon. Quirkz Media 2013 - 2015. Simple theme. Powered by Blogger.